WASHINGTON — President Barack Obama announced Wednesday that the U.S. and Cuba will reopen their embassies in Havana and Washington, heralding a “new chapter” in relations after a half-century of hostility. Cuban television broadcast Obama’s statement live, underscoring the new spirit. The embassy agreement marks the biggest tangible step toward normalizing relations since the surprise announcement in December that the U.S. and Cuba were restarting diplomatic ties. 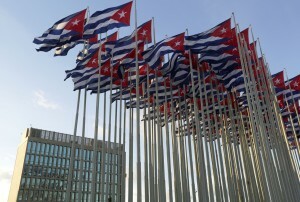 The posts in Washington and Havana are scheduled to open July 20, Cuba’s Foreign Ministry said. Secretary of State John Kerry will travel to Cuba for the opening of the U.S. Embassy. For Obama, ending the U.S. freeze with Cuba is central to his foreign policy legacy as he nears the end of his presidency. Obama has long touted the value of direct engagement with global foes and has argued that the U.S. economic embargo on the communist island just 90 miles south of Florida was ineffective. Since the late 1970s, the United States and Cuba have operated diplomatic missions called interests sections in each other’s capitals. The missions are technically under the protection of Switzerland, and do not enjoy the same status as embassies. Ahead of Obama’s remarks, the top U.S. diplomat in Havana delivered a letter from the White House to Cuba about restoring embassies in the countries’ respective capitals. U.S. Interests Section chief Jeffrey DeLaurentis arrived at the Cuban Foreign Ministry in Havana on Wednesday morning to hand-deliver the message. In a highly unusual move, Cuban state television broadcast Obama’s remarks live with translation in Spanish. Left: Photo by Reuters/Enrique De La Osa.